We are Glenn Hall and Hilde Kjeldby, living two hours drive from Oslo. I have had dogs since I was nine (boxer), Glenn a little later. In 1978 I was looking for a new breed – and fell in love with the Bullmastiff. Out of a litter of thirteen puppies I found my first girl and called her «Manila». She gave me very good experience with the breed, and we shared almost 13 happy years together. As we have no children, we spend all our spare time with our dogs. The area around us is mostly forest, and the dogs love to run around and find new smells. It is very hilly here, so they have to use their muscles and work with their balance. We have three dogs at home. That way they all get a lot of attention and walks every day. 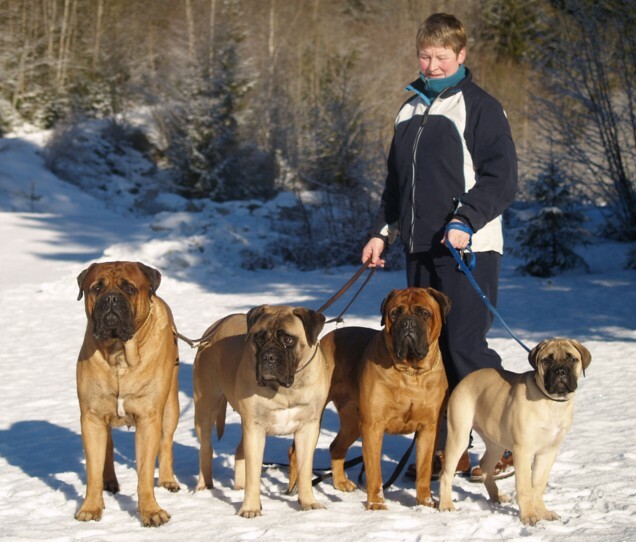 We believe a heavy breed like bullmastiff are more healthy using their body - from an early age. See our page about our view on «doglife»! We breed only when we are sure that the result could be the best; both mentally, physically and typewise. Also it is very important that they are healthy so new owners can have a long good life with their new dog. And last - but not least - the dogs must look like a BULLMASTIFF! We are hooked on the breed!